Super absorbent clay blotting papers. Absorbs excess oil like a sponge. Changes color (to black) as it absorbs oil and sweat. 100% Natural flax blotting papers. Comes in convenient paper dispenser packet the size of a credit card. 100% natural flax paper is embedded with clay, soaking up any excess oil on your skin's surface. Portable, eco-friendly paper packet dispenses one sheet at a time, and turns black when it's full so you can see what you've removed from your skin. Great anytime - just a simple quick wipe and you're good to go! For oily show through during the day, or anytime you need a little excess shine removed. Press a sheet to the oily area and lift it off - the paper will turn black, showing you when it's full of oil. 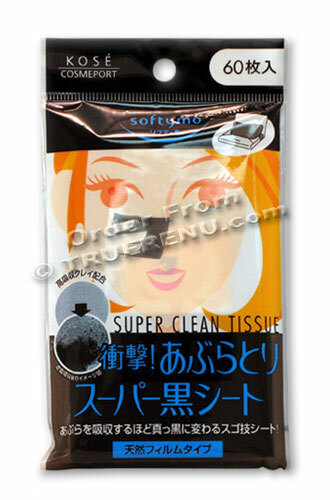 Product Size: Portable soft package contains 60 disposable facial cleasing sheets. Handy palm-size (6.5cm x 10cm).